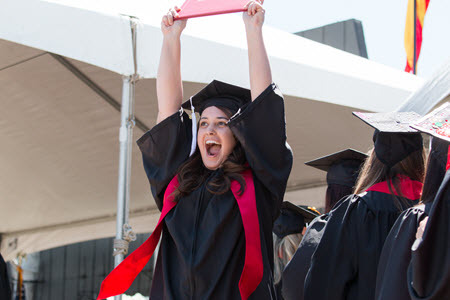 If Graduation Initiative 2025 were nothing more than a one-year effort, it still would be deemed a success at Stan State. Establishing momentum and keeping the GI2025 process moving forward is the next challenge. GI2025, initiated by the California State University and launched at the local level in September 2016, established new benchmark four- and six-year graduation rates for all 23 campuses to meet the workforce demands of California’s innovation economy in the years and decades to come. In an effort to better prepare and assist students, the CSU has established a plan to remove obstacles to receiving a baccalaureate degree. Campuses received one-time funding to execute short-term student success plans and develop long-term, sustainable programs to meet those goals. Stan State’s share of the one-time funding was $1 million. Stan State President Ellen Junn established GREAT (Graduation Rate Excellence and Assessment Team) to provide oversight of Stan State’s student success plans. And Interim Associate Vice President for Academic Affairs and GREAT Co-chair Shawna Young shared that the campus must spend the one-time funding during the 2016-2017 academic year and show improvement in graduation rates within the first year to be positioned for continued funding. “Part of what our campus is doing to improve graduation rates in our short-term plan is identifying students on the cusp of graduating and providing them with intrusive advising to ensure they’re getting the right courses,” Young said. “We’re also developing responsive course schedules to help ensure students have access to the classes they need to graduate in a timely fashion. The identification and advising process was a major component of the short-term approach. Once identified, students receive intrusive advising which is an action-oriented approach to involving and motivating students to seek help when needed. As part of its oversight, GREAT has recommended the funding of 10 programs and activities designed to improve graduation rates and/or eliminate achievement gaps for underrepresented minority and Pell-eligible students. Course Embedded First-Year Experience: Professional Development for Instructors: Professional development for instructors teaching a two-semester, first-year composition course that infuses first-year experience into the classroom. ELEVATE – Sophomore Year Success: A living learning community in which residential students enrolled in remedial English reside on the same floor, are enrolled in the same remedial English course and receive intrusive academic advising from the Housing Academic Advisor. High Impact Practices Task Force: The Task Force is developing a dashboard for analysis of the effect of various high-impact practices on student success. Winter Intersession Remedial Math Intervention: A math course offered to students who did not pass their remedial math course. This special recovery course enables students to utilize a software program, along with additional tutoring, to acquire mastery of requisite foundational skills. If students demonstrate mastery, they can enroll in general education math that counts toward graduation. Writing and Reading for Academic Preparedness: An integrated writing-across-the-curriculum and writing-within-the-discipline program heavily focused on information literacy instruction. Faculty Mentor Program: A program that fosters faculty-student interaction outside the classroom through mentoring relationships intended to improve academic achievement and improve graduation rates of educationally disadvantaged and first-generation college students. First-Year Seminars: Redevelopment of lower-division general education courses to focus on special topics related to the individual faculty member’s area of specialization. This spotlight on the instructor’s own projects is intended to transfer greater interest, engagement and enthusiasm to the students, and allow for exploration of different ways of making the process of scholarly discovery accessible to developing scholars. College of Education, Kinesiology and Social Work Undergraduate Student Success Initiative: Establishment of a specialized outreach, advising and support program for liberal studies and kinesiology majors. College Assessment Faculty Learning Communities: The establishment of college-level assessment communities with the purpose of reviewing program assessment reports and identifying college-level trends and patterns. Through college-level review, data-informed decisions can be made regarding the prioritization of resources and the development of interventions that will directly improve student learning. Transfer Welcome Program: A program designed to focus attention on transfer students and their unique needs, ensuring a smooth transition to Stan State by providing a continuum of services through the first semester after transfer.